,The changing of the seasons brings lots of new adventures, but what if you want to catch a glimpse of some of the world’s finest blooms? There’s a small window of opportunity see some famous floral sights every year, so if you’re planning a short trip to Europe this spring, why not coincide it with one of these eye-catching celebrations? 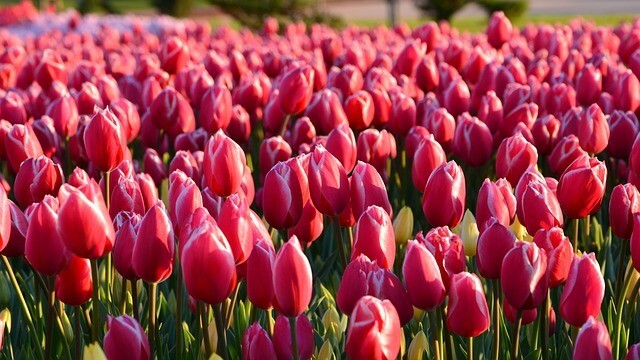 The Netherlands is famous for many things, but if you want to see their glorious tulips for yourself, then the chance only comes around once a year. In 2019, the Keukenhof Festival takes place between 21st March – 19th May so you still have plenty of time to book your tickets. Dubbed the most beautiful spring garden in the world, Keukenhof is in the village of Lisse, halfway between The Hague and Amsterdam. Here you’ll find 32 colourful hectares of 7 million blubs in bloom – a once in a lifetime opportunity if there ever was one. Or at the very least, a once-a-year opportunity. Perfect as an add on to a night or two in Amsterdam, and if you need to arrange airport parking at short notice, you can find a spot on our Heathrow page or search through our airport categories for your nearest terminal car parking options. This annual celebration in the Spanish city of Girona sees unique displays and arrangements dotted through the streets and landmarks, with the whole place becoming one big floral art installation between 11th – 19th May 2019. The city is Barcelona’s not-quite-so-well-known neighbour. So if you’re already planning a trip to the famous Catalan destination, why not arrange a visit to this quieter spot too. Although granted, it won’t be quite so quiet when the Girona Flower Festival is in full bloom, but that’s no bad thing in this instance. This one has a much better window of opportunity for visiting, with the International Garden Festival taking place at the Domaine du Chaumont-sur-Loire between 25th April – 3rd November. Not that you need any excuse to visit the stunning Loire Valley. But the prospect of taking in the 30 themed gardens during the festival has to be the cherry on top of the cake. And the Chateau is a couple of hours from Paris, so you could combine this with a visit to Paris in the Spring too. Check flights arriving at either Charles de Gaulle or Orly airports from your nearest UK terminal and Parking at Airports can help you find a cheap parking space. This means you can securely leave your car while you’re seeing those floral displays. Of course, we have the RHS Chelsea Flower Show, one of Europe’s most famous flower festivals right here in the UK. And if you’re not within easy reach of the capital, this year might be the time to plan an excursion. Between 21st – 25th May this corner of West London will be even more glamorous than usual with royals and celebrities descending to view the themed gardens and displays. If you’re coming from the other end of the country, we can help you find an airport parking space in Edinburgh or Glasgow as well as lots of other terminals further up north. There’s still plenty of time to book your spring getaway across the channel. And with lots of seasonal floral festivities taking place, you’ll be spoilt for choice when it comes to beautiful sights. Jumping on a plane at short notice has never been easier thanks to the convenience of airport parking, so find yourself a fantastic deal once your flights are booked and save time and money on those travel expenses. Find out more holiday destination recommendations by checking out the Parking at Airports blog!